A fire broke out early Wednesday morning at the Haas School of Business - located on the east side of UC Berkeley's campus near Memorial Stadium - leaving parts of three floors closed for cleanup and damage assessment. According to UCPD spokesperson Lt. Alex Yao, the department received a call at 6:05 a.m. reporting smoke coming from the school. Yao said that UCPD officers arrived on scene within three minutes and that the Berkeley Fire Department arrived at 6:14 a.m. The fire was extinguished at 6:31 a.m., according to Yao. The fire originated from a paper shredder in the mail room on the fifth floor. Yao said there were no injuries reported. The fire also set off the school's sprinkler system. At this point, there is no indication that foul play was involved, Yao said. Ute Frey, associate director of marketing and communications at the business school, said the campus fire marshal was still investigating the cause of the fire at press time. Frey said employees were asked to either work from home or elsewhere in the school, but classes continued as scheduled. 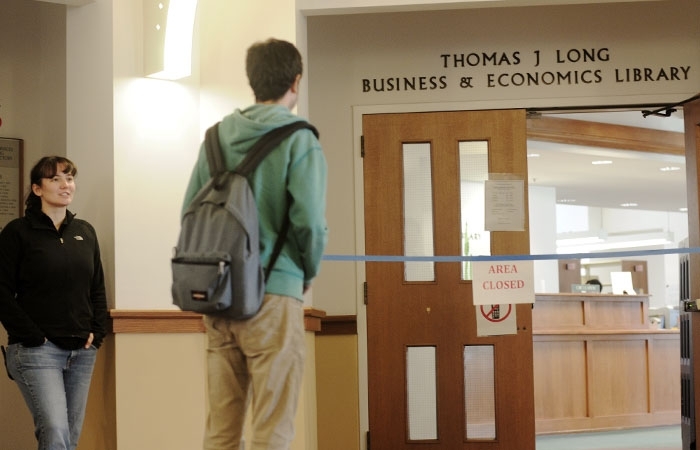 A news update posted on the school's website advised staff who normally work in the building to temporarily meet in the Bank of America Forum on the second floor of the school's Faculty Building. At press time, parts of the third, fourth and fifth floors of the Student Services Building were still closed. The news update said that besides water damage and smoke odor, the damage is confined to the shredding machine. The Thomas J. Long Business and Economics Library on the third floor is also closed, but both the computer and recruitment centers remained open. The Dean's Suite was also open, according to Frey. An email sent to the Haas community at 7:55 a.m. Wednesday stated that some ceiling tiles had "extensive damage" and some carpets, computers and printers were "soaked." Emily Ewell, a graduate student at Haas, relocated to the UC Berkeley School of Law Library Wednesday to work on class work. "Fortunately the school has been incredibly communicative about the incident to ensure the safety of students and staff at Haas," she said in an email. "(The) only impact to me is that we had a few meetings moved and some of our other rooms are more crowded than usual." an earlier version of the headline of this article misspelled Haas School of Business.